A nine-year-old Canadian Girl Scout has raked in the dough after setting up a cookie stall outside a new cannabis shop in Edmonton, Alberta. In just 45 minutes flat, Elina Childs sold $120 (US $91, £70) worth of baked treats on the very first day of cannabis legalisation in the country; completely selling out of her stock. 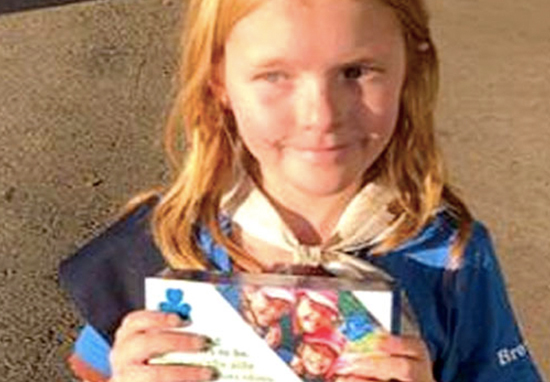 Elina’s dad, Seann Childs, helped the pint-sized entrepreneur load up a wagon full of Girl Scouts cookies which the business-like youngster then flogged to those waiting in the long queue outside of the dispensary. Some people had been waiting in line at the dispensary for four hours, with the cookies providing an extremely sweet diversion. Last year, she got bit by a dog, it wasn’t bad but we were still apprehensive. While driving, we saw how long the lines were at the dispensary, and we just stopped to sell the cookies there. She didn’t quite understand what the big deal was, She was just selling cookies in her mind, but everyone was so happy to see her, and kept congratulating her. Young Elina is not the only one to have benefitted from Canada’s legalisation of cannabis, with the country reportedly bringing in an incredible $3 million on the first day of purchase alone. As reported by Global News, the demand was so high, there were reports of newly opened cannabis shops running out of stock on the first day alone. This policy change is part of a 2015 campaign promise made by Prime Minister Justin Trudeau, who argued previous drug policies have proved to be ineffective. It is hoped this new law will keep minors away from drugs and will prevent criminals from profiting. However, the legalisation of cannabis has also been criticised by some Canadian politicians, with Ontario’s premier Doug Ford arguing how police officers haven’t been adequately equipped to screen motorists for drug-impaired driving. This is deeply concerning. And make no mistake, by rushing legal cannabis out of the door before ensuring police have the tools they need, the Trudeau Liberals are putting people at risk. Whatever your view is on the cannabis legalisation debate, Elina sure is one smart cookie. A future Alan Sugar in the baking?